South Korean operator SK Telecom said it launched an LTE-Advanced network on Wednesday, offering speeds of up to 150Mbps on an upgraded version of Samsung's Galaxy S4 handset. The operator said the service is the first in the world and went live in Seoul, parts of 42 other cities, and 103 universities. It has plans to extend coverage to 84 cities. Currently the only compatible phone is the new version of the Galaxy S4, but SK Telecom said it will offer a total of seven LTE-A handsets this year. The operator said the new offering is twice as fast as its existing LTE network. It will use the faster speeds to launch services like the world's first full HD video streaming service, which will go live next month on its paid TV service, "Btv mobile." The carrier used a technology called Carrier Aggregation, which can combine different frequencies on a mobile network, to create an effective 20MHz spectrum band by combining two smaller channels. Much faster speeds are coming - the current standards allow for up to five 20MHz bands to be combined. LTE-Advanced is the successor to LTE, which has become the industry standard for current high-speed networks. Japanese carrier NTT DoCoMo developed and proposed the standard, and says it will launch a 1Gbps LTE-A service in 2015. DoCoMo's current LTE network provides downloads of up to 112.5Mbps. Other carriers worldwide, such as Sprint and AT&T, have said they plan to launch LTE-A networks this year. SK Telecom said it won't initially charge extra for its faster speeds. The company said it has been rolling out base stations since last year that can be upgraded to LTE-A with software upgrades. 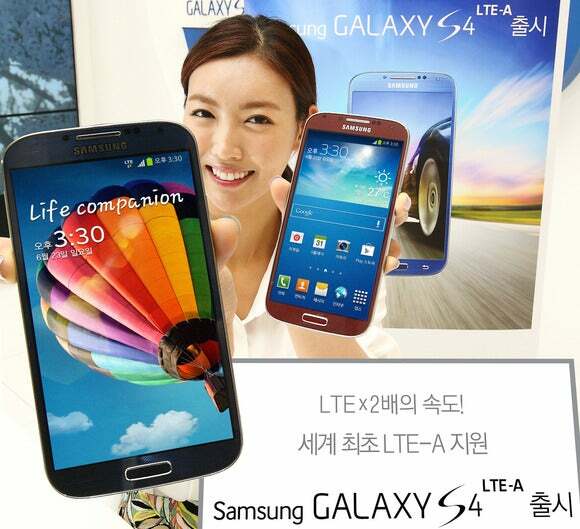 Samsung's Galaxy S4 LTE-A handset is similar to the original S4 launched in April, but has a faster Qualcomm 2.3GHz quad-core processor. The Korean version also features new software that can find and play video related to images viewed by users and has the ability to play high-resolution digital broadcasts of live television programs and sporting events.